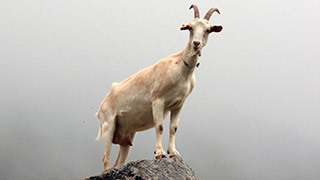 Goats are cloven-hoofed mammals that are closely related to sheep. There are over 300 different breeds of goats and they're one of the oldest domesticated species as they're used for their milk, meat, hair and skin. Most goat species have two horn of carious shapes and sizes depending on the breed, sometimes horns are removed after birth to reduce injuries to humans and other goats.